The Atlanta Braves 2019 Spring Training Schedule begins on Saturday, February 23, with a road game against the New York Mets at Port St. Lucie, Fla. 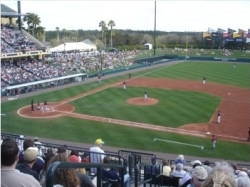 The Braves open the home portion of their spring schedule on Monday, February 25, versus the Washington Nationals at the ESPN Wide World of Sports Complex in Lake Buena Vista, Fla. This coming spring will mark the 22nd and final year that the Braves will train at the Wide World of Sports Complex. The Braves will conclude the Florida portion of their exhibition season with the opening of their new spring training facility at North Port, Fla., on Sunday, March 24 against the Tampa Bay Rays (4:05 p.m.). The Braves will then play a pair of exhibition games at SunTrust Park on Monday, March 25 (7:20 p.m.) and Tuesday, March 26 (1:10 p.m.), against the Cincinnati Reds. Atlanta will play a total of 16 home games against 10 different teams at Champion Stadium, including three games versus the Detroit Tigers and two games each against the Houston Astros, Miami Marlins, New York Mets and Washington Nationals. The New York Yankees, Philadelphia Phillies, Pittsburgh Pirates, St. Louis Cardinals and Toronto Blue Jays will make one visit each to Disney. Champion Stadium is located at Disney's Wide World of Sports in Disney World. Eastbound, take I-4 east to Exit 65. Follow signs for "Wide World of Sports." Westbound, take I-4 west to Exit 65. Follow signs for "Wide World of Sports." The ballpark was completed in 1997. 330' down foul lines and 400' to center. Individual spring training game tickets for the Disney portion of Atlanta's spring training schedule range from $15.00 (general admission lawn seats) to $60.00 (lower level reserved seats), and will go on sale Monday, November 19, through the Atlanta Braves' website (braves.com/springtraining), at the Wide World of Sports box office, and through Ticketmaster (800/745-3000).